We’ve always believed advertising can change the world. Over and over we’ve seen the impact of a well-placed, well-printed, well-positioned premium or the whirlwind that can stir from an “outside the box” guerilla campaign. For today’s consumers, it’s all about the experience – one that typically begins with something that’s meaningful to them in some way. At ePromos, we’ve long been focused on masterfully creating and delivering that meaningful experience at all touchpoints, from branding to purchasing, warehousing to delivering. We’ve been able to understand and deliver on the mission as a whole, often creating campaigns that have the power to drive movements forward – because, often, all it takes to move the needle is the slightest push. A recent example truly inspired all of us at ePromos. For more than three decades, ePromos EVP Jeff Pinsky has been involved with an incredible organization, Community Mainstreaming. This Long Island-based charity builds and maintains group homes for developmentally-challenged adults throughout the area – adults with Down Syndrome, Autism, learning disabilities and developmental hurdles – and this time, their new partnership to raise Autism Awareness is outstanding. Though capable, competent and enthusiastic, these residents are, often, overlooked by mainstream society – and Community Mainstreaming seeks to change that for good. The group helps participants learn basic job skills and helps them find work at local libraries, markets, bakeries and more, so they can contribute to the community and better their own lives. One recent participant was 20-year-old Julia. 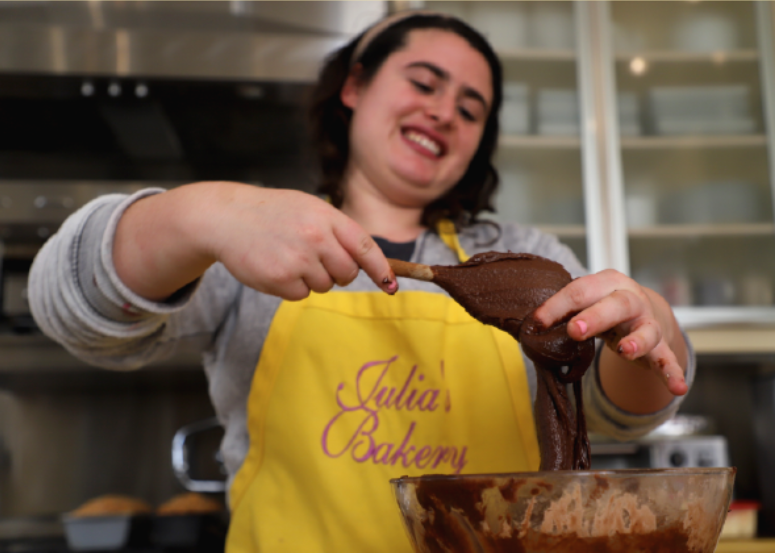 Julia was placed with Community Mainstreaming partner Coffeed, a locally-owned coffee shop and bakery so she could better explore her passion for baking. Quickly, Julia’s time at Coffeed became the highlight of her week – and, with guidance from her mother Arlene and her colleagues and peers at Coffeed, Julia took charge of a massive fundraiser that, already, is making serious waves. Together with her peers at Coffeed, Julia is in the process of baking 5,000 to 10,000 dozen cookies to raise money for National Autism Month – Julia was diagnosed with autism at age two. These cookies are, now, on sale at www.JuliasCookies.org. In March while still in pre-sale mode, the team sold 12,000 cookies—and, now, they’re looking ahead with a goal of raising $250,000 in profits. Immediately, ePromos and partner vendors joined the cause. Ruckus Media, an ePromos partner, built the Shopify site to sell Julia’s cookies, and partner TekWeld provided stunning custom cookie boxes at cost. Mid-Nite Snax is providing all packaging, fulfillment and preparing shipments for free, saving Julia’s team upwards of $20,000. ePromos was also quick to continue its commitment – the company has worked with Community Mainstreaming for more than 20 years. ePromos’ Maria Tosti created all packaging as well as the website layout and design, and the team supported Julia with vendor management and order processing. This added support helped streamline the sales and transaction processes, helping Julia’s team maximize their revenues while creating a level of professionalism that separated their fundraiser from other, more established campaigns. Now up and running at full speed, Julia’s fundraiser has already generated significant buzz from outlets such as NY1, New Fork City and more. Cookies are limited – and they’re delicious! Order yours now at www.JuliasCookies.org, and choose from oatmeal or chocolate chip, all shipped fresh in beautiful, professional packaging—with all proceeds benefiting Community Mainstreaming and NEXT for Autism.